Rodney Tatum of Mirror Reflections Auto Spa shares what exactly imperfections are, how to remove them and how to prevent them in this 4 part article series. Click here to read them all! I want to thank Corey Carruth of Carpro, Jeff McEachran of Gyeon, and the many detailers experienced with professional level coatings who took the time to assist me with this article. As much as I am trying to offer, I learned equally as much from their experiences. I have a confession. My heart wants to take each wrecked car I see on the street and polish it for days. I watch a lot of the cool restorations on YouTube too. Oftentimes that is not the real world when it comes to what professionals do to make a living. This dogmatic point of view by some people, that paint correction being an all or nothing job, is often taken to the extreme when discussing coatings. This ignorance only creates more problems for the detailing industry and confusion for the consumer. Many people who have looked into applying or paying someone else to apply a Ceramic Coating have asked these questions. The answer to the first question is yes, some polishing is necessary. I can not give a simple answer to the second question, as there are quite a few variables to this supposed dilemma. It is my hope that upon the conclusion of this article you have a full understanding of what I mean by both answers. Since ceramic coatings have taken on a more main stream appeal, a lot of misinformation has circulated regarding polishing and coating. I will do my best to provide clarity on the topic by explaining why some polishing is necessary and why paint correction may or may not be necessary. But why is some polishing necessary? Applying a coating without at least a quick polishing prep is negligence by a professional. But providing a concourse service to someone who will certainly only clean his or her car with automatic car washes can be just as reckless, regardless whether a ceramic coating is being applied. That is where the lines of polishing perfection before coating start to blur. Not all coatings are the same. I do remember applying Carpro Gliss to a car that I polished to a high level. The magnification of the car’s beauty was obvious. Subtle yet still noticeable though was a deep scratch that could not be removed. A case can be made for emphasis on a close to flawless finish as well emphasis on long term protection value. The case for the person who wants a flawless finish. He or she is going to be making a significant financial investment already. With coatings offering long term protection it makes sense to get all of the polishing out of the way. That 10% extra gloss a coating provides is going to look incredible on near perfected paint. One of the attributes of coatings are they can act to some extent like a magnifying glass, particularly strong and glossy coatings. Yes, paint with lots of scratches and swirls can actually look worse with a coating over it. The paint ofcourse can also look incredible on near flawless paint with a coating over it. 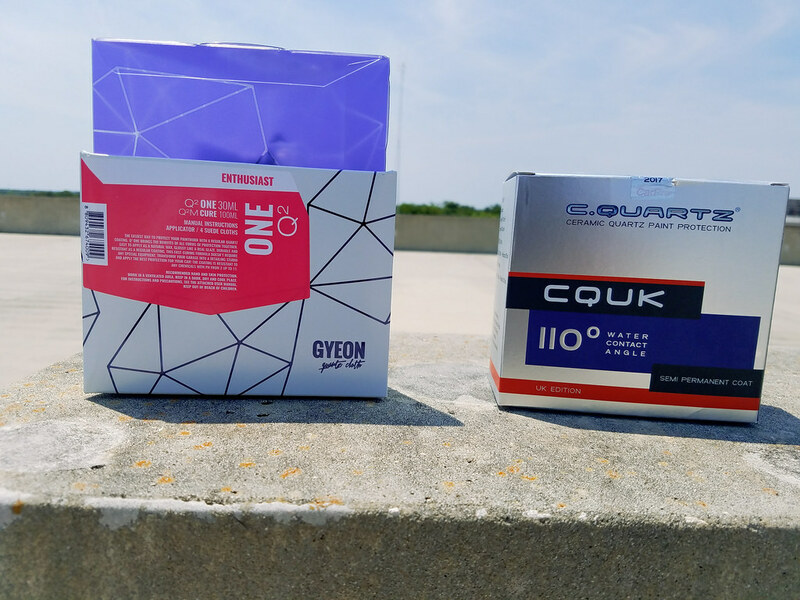 Gyeon “if the coating is applied over damaged/defect paint which are a million peaks and valleys then the coating would be a copy of the paint below it. This person is fully invested and will more likely take care of the vehicle, seeing the protection as an aide in keeping the paint in top shape. The vehicle will probably not be driven as much as your typical grocery shopping and rode trip vehicle. It will be put in harms way less often. The case for the person who just wants the protection. This person values the ease of maintenance, but differently than the person who wants near perfection. They take pride in how their vehicle looks, considering it is a more expensive option than usual upfront. But due to perhaps budget, and or realistic expectations for how the vehicle will look in long run it is not PRACTICAL to have the car polished to near perfection. This person usually receives a wash and wax, an AIO polish, or maybe a 1 stage correction service. But now a ceramic coating investment is seen as a good alternative. This person thinks to his or herself “my car will probably be better off in 1 to 2 years with a coating than previous options.” The vehicle is going to be driven a lot, possibly around a lot of inconsiderate drivers. They may not have the dedication or interest to wash the vehicle as safely or often as someone with a more enthusiast passion for their car. So ease of maintenance means something different to them. At the same time a quality 1 step polish and coating, is probably going to leave their vehicle looking far better for far longer than most other vehicles. Let us assume the proper minimum prep work is performed including some polishing to clean the surface. You have the detailer who provides a service to the customer whose focus is mostly on the protection a coating offers and or has a cap on how much he or she is willing to spend. There are going to be more people who fall into this category than those who desire perfect paint with a coating. Concourse detailing is not for everyone and the same goes for customers who want a coating. There is NOTHING ethically wrong with providing this service that is very profitable and satisfying to customers. At the other end of the spectrum, there is the professional who has the one size fits all ceramic coating package. Extensive correction is required based upon the condition of a vehicle. Let’s look at it from a company perspective. If you are purchasing a coating package from a reputable shop, you are probably spending a good amount of money. The concern about a client’s peers seeing a several hundred dollar investment with visible defects in the sun is genuine. Depending on the coating and how damaged the paint is, it can to some extent illuminate imperfections. Also a vehicle in really bad shape with a customer not interested in paint correction is a warning sign that a potential customer may have unrealistic expectations for what they are receiving. The point that I am getting across is that as long as their is a communication, the service fulfills the coating manufacturers guidelines, and proper ethics are involved it is the detailer’s prerogative what level of polishing they want to require. Some polishing is a necessary part of proper prep, before applying a coating. Chasing perfection, removing all swirls, etc is not necessary for a coating installation. Perpetuating this myth and shaming others for offering options for both types of customers is reckless and irresponsible. For some coatings that I offer, a one stage correction can sufficiently improve the appearance to my satisfaction and alleviate the concerns about proper application. With some higher end offerings; professional only or base and top layer coatings I may require more correction. That way I have something to offer both consumers. There is a service and detailer for every client. Providing the option of a service for someone who prioritizes and budgets just the long term protection and for someone desires most defects and all swirls removed with a coating application should be the prerogative of the professional. For the consumer reading this, as long as the minimum polishing is performed performed, I encourage an open dialogue about your expectations with your detailer of choice about defect removal. Gyeon – “having the paint in the best possible condition, that matches the customers needs and wants, is the first consideration. Products like HD Speed or Blackfire All In One, I do not recommend using prior to applying a coating. Many people mistakenly believe an IPA or paint prep spray can take the place of many previous steps of making a surface surgically clean. 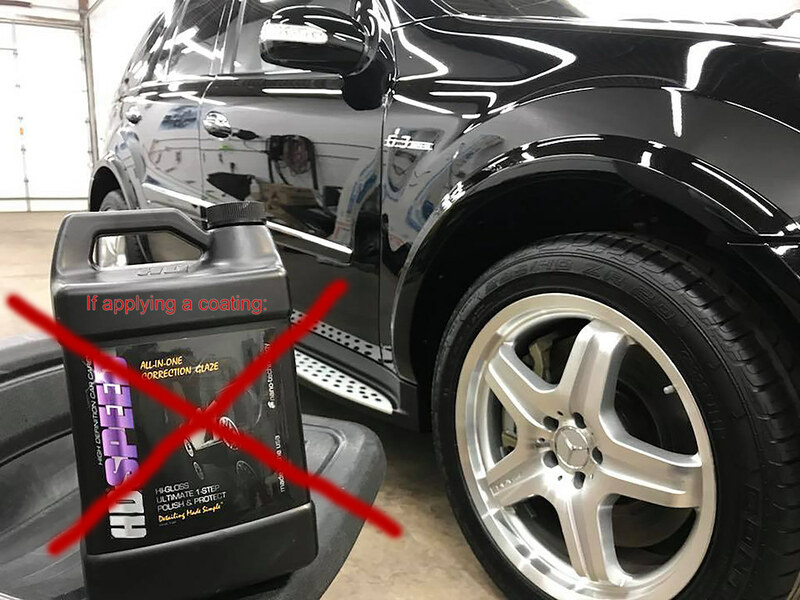 Carpro – “Whether it be oxidation, residue of a polymer sealant or wax, or 100 other things that you didn’t completely remove with chemicals alone, the coating MIGHT not bond.” This makes using an All In One (with exceptions to coating primer polishes) product a terrible last polishing process. HD Polish would make a great alternative. 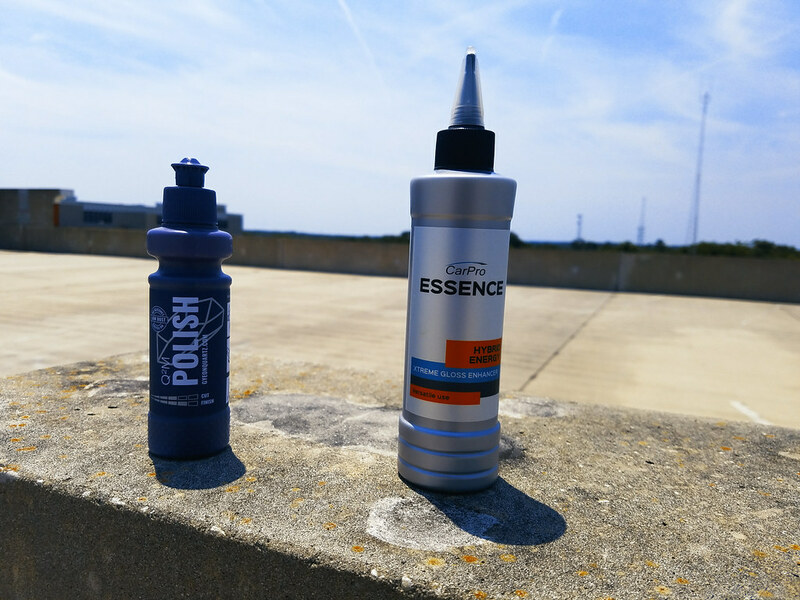 Gyeon Polish or Carpro Essence are also good options. Great article, Rodney. Listening to the customer, expectations, and education! Rodney… about this series…you hit it out of the ballpark! Great article! I am 100% with you that there is NOT a “one size fits all” ceramic package! we off our “paint prep” services separately from our Ceramic coatings, for just that reason! we explain the surface needs to be properly prepped, but like you said, some people just want the protection of a ceramic, NOT the perfection of multiple passes of polishing. Well written! This was a very much needed article, as far as he speed however, is it viable to use speed, followed by ipa wipe, and finish with essence? Viable? The short answer is no. Is it viable in the sense that you will ultimately get to where you are trying to go? Perhaps. But at best very inneficiant. There is nothing wrong with HD Speed, but it is a great option for SOME not all detailing tasks. Look at it in these two ways: Wax/Sealants are contaminants. For what you are trying to accomplish the polymers and montan wax that come with Speed are adding something you don’t need to add. So not only are you not as accurately seeing your work, if that IPA does not remove (very possible) remove that product you are makimg Essence work harder. I imagine in the long run also eating up your pads. Also being designed as a finishing polish, its corrective power is weak in addition to being further masked and weakened by the protection it leaves behind. This leaves me to HD Polish and HD Cut. I bring up HD Polish because I get the feeling a lot of people are comfortable with that one polish (Speed) and don’t want to branch out. At a nice price point like a lot of the 3D products, there is nothing HD Speed can do that Polish can’t minus the AIO aspect. The chemist aren’t trying to pull a fast one. A lot of people really like HD Polish. There is also HD Cut for that traditional two step agressive to mild with Essence. With multi year coatings, even with good maintenance, around the one year mark, it is common for the slickness and hydrophobic qualities to be compromised somewhat. The coating is still their. Even though contamination will not stick as much to a coated car, there will still be build up. Especially because you already have a good product in Reset for coated cars, a simple Iron Remover product should be able to refresh the coating. I reccomend in your case, a wash and then Carpro IronX to be followed by Reload. That should bring your car back to where you want it. IF not, I would inspect for waterspots and use their waterspot remover if you think that may be the problem. I did not mention TarX because with Reset (slightly alkaline I believe) and use of Reload monthly, you strike me as someone who is does a very good job of maintaining a coated vehicle. IronX should do the trick for you; which it is normal after a year. The one bright spot to having a coated vehicle is you can perform these activities (especially IronX) in moderation without significantly compromising the protection. That is very good to know as I do have about a 1/4 bottle of the ironX TRIX. Would you recommend waxing over this coating as well? What is the process of reapplying the ceramic? giving you that little bit of extra you are looking for. The one thing I will add is taking into account when you reapply if the coating is still present. If you are to do it now, it may require a mild compound for full removal of the coating. Well, I recently purchased a 2019 Ford Mustang Bullitt and I wanted to hear from the best what your thoughts are regarding a ceramic coating. You know from the previous post I used the CarPro Cquartz UK and maybe I should stick with it since I have the CarPro reload, shampoo, etc. I have never heard of the EcH2o before now. Since I already have the reload and the reset car wash I am a little confused where this would be needed. So exactly when will you know the ceramic coating is no longer working? Is it a matter of just compounding and reapplying after about 2 years? Stephen sorry I have been away a while. Knowing when a coating is fully gone unfortunately is not the easiest thing to determine. Most people look at hydrophic properties to determine this, which I believe is not very helpful. Suspecting how well you take care of the car already, I would look for these signs no earlier than the 18 month mark. Ease of wash: I think this is the biggest sign. Do you at some point in that post 18ish month mark notice dirt etc sticking more to your car. I feel like that is probably the best indication (there is no great indication) the protection is dying or dead. I also feel if you are at that point a medium polish will suffice. The EcH20 is a relatively new product. Meant to be a waterless wash and secondly a quick detailer. But it was quickly discovered that it makes an exceptional rinseless wash. I can vouch for that. I brought that up to give you another option (one more tool) for your convenience maintaining Cquartz. But what you are doing, especially if you are happy as is, is just fine. No worries. Thanks for the info. You are my go-to person when it comes to detailing. Thanks for the great article! So many great scenarios. Helps us make a more knowledgable decision about ceramic coating. I would dfiniltey not try to do this myself!